You know what... I just looked at my blog counter and realized that there is a total of 1001 posts published here! What would you say about a small giveaway, hm...? You don't have to jump through loops to win the goodies. All you need to do is to leave a comment below saying what your wish for 2016 is. You have one week to do so, I'll announce the winner next Wednesday - December 9th. I want health, money and a larger scraproom! my wish for 2016... a peacefull world. I don't know much yet about Mica powders but it looks great!! Awesome my wish for 2016 is love hapiness and prosperity for all my friends and family. Wishing for a crafty 2016 and lots of time playing with all the new crafty goodies. Any chance of getting my wish to have you to visit again next year? In 2016 I want to stop being afraid to try new things and to step out of my comfort zone. My wish for 2016 is good health for my family. My mum introduced to me a lot of art and craft and I lost my mum last year to breast cancer. I built the courage up and went to Finnabair's class in Drouin Victoria in November 2015, which was the first time I did something without my mum. I have now joined the Wanderlust 2016 Art Journaling and very excited. So my wish for 2016 is to achieve some confidence in my art and to know that my mum would be very proud of my achievements throughout the year. Thank you Finn for starting me back on my journey that I started with my mum. Oh wow. Would love to give these a home. My wish for 2016 is for continued happiness and health for my family. I have two children and each has gotten married in the past year. We love their spouses and enjoy when we can all be together. Oh besides increasing my art world and creating to my hearts content for 2016. One thing would be nice is peace in the world. Ok my bit for 2016 and I would love to win. I hope that we have peace and security for the new year. Thanks for this giveway. For 2016 I wish to be in the dream team of ..... And provide continue my passion for the arts. My wish for 2016 always starts off with wishing everyone good health and happiness, but personally I would love to get more time to do my crafts and create. I am a full time working mum and I squeeze in as much scrapbooking and crafting but I am always wanting to do more. Time is usually my enemy. Omg, my wish for 2016 is to carve out some dedicated art time for me, myself, and I to do more art. I take care of a lot of people and work full time, and I never seem to have enough time to feed my soul with art. That is my wish....and world peace, of course! Thank you for the give away, Anna. I wish a safer and peaceful world for 2016 (and more Finnabair products, but this one is just for me...). To spend more time with my family! Hi Finnavar! My wish for 2016 is peace on earth! I know it's a big one but how can we acheive it if we don't at least wish it. Well let's say, let's first wish and make peace in our surroundings" That can be a start! Thanks for the gieveaway! Many personal wishes...but in the scrapping world.. would just wish to be able to keep on improving and trying new styles and products!!! I have one wish. One that will likely not happen. That wish is for worldwide PEACE. I know it's asking a lot, but World Peace would be nice for 2016. Of course I'd love to win this giveaway in the meantime. New to your style, but love all I see. I hope to create some beautiful things as inspired by the classes Finn held in Australia. Most of all I hope for peace across the world. My wish for 2016 is pure, unadulterated happiness. Crafting is calming and brings a smile to your face when you see what your imagination and hands created. Everyone should experience that type of happiness and contentment! My wish for 2016 is to spend more time at my art table! First and foremost i wish for a healthy and happy family. .and lots of time to play with all my crafts. .
My wish for 2016 is to get more time creating fabulous memories for my family. I never really get enough time. Happy Holidays everyone! That my daughter with MS remain healthy & stable during her pregnancy & delivery, and that my newest grandbaby be born healthy in June 2016. My with is to have a year full of creative inspiration and new friends. Wow! Great giveaway! My wish for 2016 is good health and lots of happy moments for all my friends and family! Congrats for all thé comments! I love your products! My wish for 2016 is that I can use more of the products in different ways. Also that I have time to come and see your store in Dublin. My Christmas wish is that my family can find it in them to heal together and be a family again. I wish for a healthy year for all the ones I care and love. My wish is for less violence, home and worldwide. The killings have to stop. My wish for 2016 is that all my artist friends are successful in their projects and blissfully happy with their art! My wish for 2016 is for good health; physically, mentally, emotionally and spiritually. Being creative helps all 4 aspects of my health! Thanks for the giveaway Finn. What a wonderful opportunity! My wish for 2016 is that our world could put aside their differences and live in peace! We all want a place where we can expand our horizons and fill our space with beautiful creations. Thankful for all who have taught me through classes and posts that inspire! I wish health for my husband who is having chimio. And I wish more peace on earth for everyone. Congrats on 1001 posts! My wish for 2016 is peace. I wish for good health for my family, friends and Co-workers. We have two battling cancer and hopefully 2016 will be the year they win. Hoping that 2016 brings us health and financial stability! The best would be world peace! Don't we all wish! that would be such a nice gift ... I love your art !!! My wish would be that the whole world would be filled with loving art instead of fighting - take up the brush not the guns. I hope these terrorist and their actions would crawl back in their caves. I am wishing for a big jolt of creativity and energy! my wish for 2016 is that my children find happiness and stay healthy. I wish to be a better painter. I wish to continue with growing in my artand my self my Dad (82 years old) and my son a healthy happy year and all my on line friends and angels of inspiration to have health peace and happiness. fantastic giveaway! thanks for the chance to win some of your wonderful goodies...my wish is for next year to be better than this one. How awesome. My wish for 2016 is for life to be easier on me and my son, to find a job I love so I can leave the present one I have and to move to CA back with my family. It's alot yes. But really what I wish for. Thanks for the chance. There is so much I could wish for in 2016.. BUT I have one wish, nothing to do with scrapbooking, not joining a fabolous designteam, not buying tons of new product (witch would be awesome btw)Not winning loads of money. My wish is not for me, it's for someone else .. I wish my husband would get a job in 2016.. He got laid off about 4 months ago and the thing that would give me the most joy to see him happy again. :) Awesome giveaway! Fab Brushes! My wish is to be more creative and express peace love and harmony through art. My wish for 2016 would have to be a blessing to others, and second to profect my mixed art with the help of Finnabair medias. love to have this chance for your give a way! 1001 is a good number! ;^) I want to make art more consistently in 2016! I wish the elections go well in 2016. CONGRATULATIONS on 1001 - that's a LOT of CREATIVITY and a MAGNIFICENT MILESTONE!!! My wish is for better health so that I can spend more time with family & friends and more time crafting too. I wish for many many creative play dates with others in my studio. Starting in January, I have committed to meeting with 10 others every month to PLAY and CREATE. First day is anything Finnabair inspired! Thanks..love your work! In 2016, I want to reach for new media, such as silcs, mica powder or wax to give my work more colors. I would also like to try embossing techniques. My wish is for some peace and understanding in our world! Thank you for the opportunity to win! My wish for 2016 . . . good health for family members. Better health for me and peace on earth. I am really hoping to be organized in 2016 , so no Kaos would be my wish. Wow, what a treat it would be to win...love your style. My wish for 2016 is peace in the world and at home! I wish for more kinds to one another. I'm sure it sounds cliche, but there really needs to be more kindness in the world. Honestly, my number one wish for 2016 is a complete end to the terrorism of ISIS and all their affiliates. I am tired of hearing about all their inhumane acts and I am tired of them getting attention from it. They are essentially starting a third world war for no reason. They make me ashamed to say I am a human being. They are destroying our world. Nice to have met you in Edmonton! My wish for 2016 is for my family and friends to have joy and happiness and for my craft room to grow during the night and add about 10 more feet of space for all of the great items that will be coming out next year hehehe. I wish people would get along in 2016. There is too much hate and violence. Ohhh congratz on 1001 amazing posts! Thanks so much for sharing always! My wish for 2016 is wellness and joy for my family and new beginnings. Happy Holidays! Wow first comment? Lucky me!! My wish for 2016 is world peace. All this fighting, people dying and hatred in the world is so depressing. Just think how happy everyone would be, smiling all the time and loving each other. I'd like to think it is possible, and it better be sooner than later. And a less important personal wish is that I grow as an artist and everything that I have been taught over the years finally all comes together. I wish that everyone in the world was a little kinder to each other! I'm sure the world would be a better place. My wish is Peace on Earth, Goodwill toward Everyone! World Peace Please, really no other words needed! Wishing 2016 is full of love, happiness, health and creativity. World Peace Please...no other words needed! Thank you for the chance to win some wonderful products! Lovely giveaway! My wish for 2016 is to spend more time with my extended family and have lots of photos of family events to scrapbook. My wish for 2016 is for all of my children to move back closer to home :) A little selfish, but moms can be like that, LOL! No gimmick here but I'd really really really like it if the world would calm down, and that we could all get along and respect one another. What the heck is wrong with that? So to put it in one word I'd like peace, for all of us. Love your products and meeting you in July at Donna Downey's studio was one of the highlights of 2015 for me. Merry Christmas Finn! My wish for the new year is that humanity learns that there is nothing worthwhile but love. Too much to ask? well I do wish for it, but I also wish for more time to create and cool supplies to do it with! My wish for 2016 is to grow as an artist and to be an inspiration for the younger artists in my life. My wish is to be brave and pray for the creative juices to flow. To venture further into the mixed media field and use the skills I learnt in your classes. To immerse myself in the love of art. I wish for clarity of mind in 2016. Of course right now it has to be world peace. I know how that sounds but I'm so tired of seeing acts of terrorism playing out all around the world. My wish for 2016? A new world... one of peace, the end of death and hatred... a garden that we live in with no fear. My wish for 2016 besides world peace is to share more creative time with friends. Merry Christmas and Happy New Year! My wish for 2016 is that the entire world would experience peace for just the space of an hour; after that, I think everyone would pursue it individually! I also wish more people will turn to art as a way to channel their inner joy, peace, love, and, yes, even their anger, disappointments and fear! Art heals and cleanses and nobody gets hurt! Here's wishing for a healthy and safe 2016, enjoyed with family and friends, mixed in with a huge dose of arting! 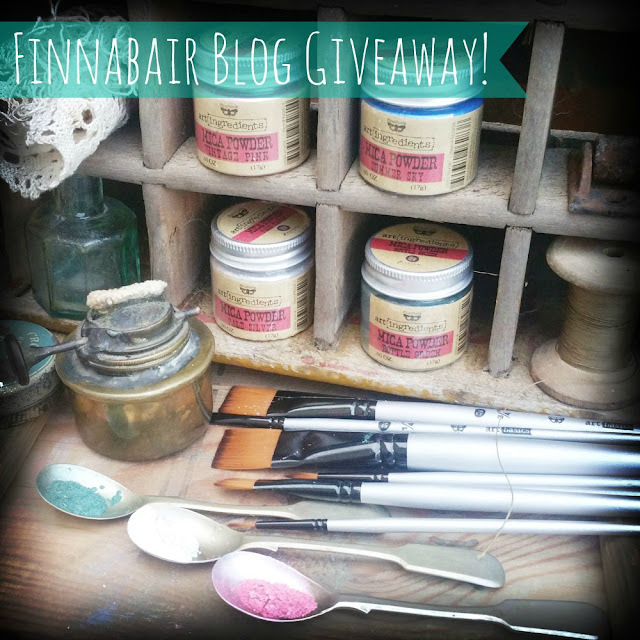 I wish for more Finnabair Art Basic products in 2016!!!! Since I can't control world peace, my wish is that I personally be more hands on crafty...with family and friends. I wish to have more time to create! I would love to win these amazing supplies, I have been watching other artist use them and would love the opportunity to create using the mica powders. I just ordered your beads. I wish to take a class with YOU! :-) Thanks for the chance to win some product. My wish for 2016 is to have more time to spend with my family in Boston and Mir time to spend with my art in Florida. My wish is Peace and a chance to express creativity for everyone. So thoughtful of u,congrats on 1001 posts! :D my wish for 2016 is to really get some time to get into my crafting,more so than any year yet! & for my family that we should all have good health! My wish for 2016 (for myself anyway) is to get myself more organized and to let go of old things (and ways of thinking) that no longer help me grow. Hello, Anna, Tomorrow I get to meet my first Grandbaby Daughter. My wish for 2016 is that she is healthy and has a creative soul, (like her Grandmom) I can't wait to make beautiful things with her. My hope for 2016 is to have more time to learn new pencil and watercolor techniques and Finnabair techniques so winning your giveaway would certainly get me started on at least one of my goals. Thank you for the chance to win. My only wish today brought to mind an old song by the Youngbloods-Come on people now, smile on your brother everybody 'Get Together' try to love one another right now! Congratulations on your 1001 post-you bring much beauty and joy to this world-it needs it. My 2016 wish is to spend more time on creating beautiful things! Wishing for Peace on Earth and a Finnabair class in Texas , so I can learn how to use the Mica products . Happy crafting and Merry Christmas , Happy Holidays . Hi Finn and congrats on 1001 posts! What I simply wish for is peace. I know craziness is a part of life, but I wish we would just stop for a moment and show some love to each other. My wish is for my sweetheart to have a repaired heart and good health. His smile, when he feels good, sparkles like your mica powder! My wish for 2016 is to meet you again and afterwards actually remenber how we did what we done. Merry Christmas and Happy New Year dear Anna. My wish for 2016 is for my husband to be healthy again and pain free!!! My wish for 2016 is clarity! My wish for 2016 World Peace, an End to Starvation and a Cure for Cancer. My wish is to be more creative. I would love a week (or possible more) of no terrorists wrecking havoc anywhere, or shootings, just a peaceful boring week, big wish I know, but you asked and that would be delightful. My wish for 2016 is to find out where my mojo went & get it back and good health & happiness for everyone! My wish is to own at least one of all your products! Wishing for happiness for my children - lots going on - just want to see them thrive. I want to spend more time in my craft room, more time for me! Thanks for the giveaway! In 2016 (and beyond!) "Do more of what makes you happy" aka LIVE life!!! Health, happiness and prosperity for all!!! My wish for 2016 is to have better control of my chronic migraines and head pain so I can have more of a life and also be able to craft more. So wanting to try the micas! Thanks for the chance to win! I wish a better year in every way. Health and happiness, work and good nerves. But not too much work, so that there's time for Wanderlust also. My wish for 2016 is to loosen up artistically and fly! Please God don't leave any kid alone or dead from human acts...My wish and my prays for people in war or being a refugee...Happy hollidays to all.. I wish more time to craft (who doesn't 😂). I also wish everyone Happy Holidays! My wish for 2016 is to spend more time perfecting my craft and making my business a success. I would say my wish for 2016 is to overcome my fear of success. That seems like such a weird thing to say, but it's true- I'm afraid of the responsibility of success- of paying taxes, of meeting deadlines, or living up to expectations. I long for it and fear it at the same time- but I know I can be successful, and that it will help me to grow and progress as a person, not just as an artist or a career woman. My wish for 2016 is more Peace no terrorism. More Peace with my Inner self. And much more Finnabair tutorials, love to learn!!! My brother is a physician in the US Air Force and he's being sent to a terrorist hot spot overseas in the beginning of 2016 for 6 months to provide medical care to injured troops and civilians. My wish is simple but so important, for him to stay safe and healthy while there! With all that is going on in the world today I really wish for Peace on Earth. I wish that we could be more kind to eachother. For me I wish that 2016 is healthy and creative! Thanks for the chance to win! My wish for 2016 is more Peace, no more terrorism. More Inner Peace for myself. Much more Finnabair tutorials, love to learn from Finnabair!!! I wish for 2016 only two things - peace and health for everyone! Hugs! First of all, I wish that we all have good health. I would like to be happy with my family and friends. Health, a good job and more crafting! Oh, I really wish for 2016 that my son finished his school well... and Mica Powders, of course))) thanks for the chance and congrats on post 1001! My wish for 2016 is scrap more and more !!! Thank you very much for this play. My wish for 2016 is to be happy with my family and my friends, and maybe have a third baby. Maybe... And peace in the world, I hope. Congrats Finn on the number of posts. My wish for 2016 is for health, peace and happiness for my family and friends. Congrats with your 1001 posts! Great giveaway! I would certainly like to win this! Thanks for the chance!!! My wish for 2016 is probably a cliche...... peace on earth! My 1st wish is for this crazy world to share peace & work at fixing how we have messed up our planet with chemicals & rubbish. Then of course, I would wish for more time & unlimited tools & toys for craft work! 2016 sorted!!! happiness...and more time to craft!!!!! I whis litle more time to craft and more products to play with. Thank you for sharing! Shared your giveaway too. For 2016 I wish... The world will stop fighting. ..